Is online meeting technology ruining productivity? Taking part in an online meeting is an everyday occurrence for most office workers these days. Indeed, where would we be if we couldn’t have a video conference or a Skype call? Online video conferencing is a $4bn market which is expected to more than double over the next seven years. There are dozens of services available, but Microsoft’s Skype tops the list with just over 22% market share. Cisco’s WebEx is the next biggest system with 11% market share. This is a big arena, with massive global companies taking part. Online meetings are not “small fry”. However, are they as useful as all this data might suggest? Here’s the problem – businesses love meetings and these new technologies have made meeting up even easier. In the past, meetings would have been more difficult as you needed to book rooms or even travel. Now, everyone can meet no matter where they are based. Goodness, they can even attend a meeting in their pyjamas these days thanks to the technology..! The ease with which we can now “meet up” is so significant that businesses are having meetings all the time. Anyone who has been in business for a while, though, knows that most meetings are, frankly, time wasters. People get called to meetings which they do not need to attend. The typical time-slot for a meeting is an hour when in many instances ten minutes will suffice. Plus, meetings generate lots of paperwork before and after the event, further eating into time. Plus, research shows that the more meetings that individuals attend, the more they suffer from fatigue and pressure of work. In other words, meetings affect the well-being of employees. Online meetings have other problems, beyond the bounds of whether they are necessary in the first place. People appear to get “information overload” with electronic meetings. This means that they don’t actually benefit from much of the meeting. Furthermore, the distractions available during online meetings means that many participants are busy doing something else, rather than taking part. Pat yourself on the back now if you have never “slipped away” from an online meeting or conference call and checked your emails or taken a quick peek at Facebook. The result of all this non-meeting activity and overload of information is that further meetings have to be called because the first one didn’t achieve anything – often because people were not fully participative. Furthermore, in frustration many business leaders then call a physical face-to-face meeting to underline what they have done in an online event, just to make sure that “everyone is on the same page”. Millions of business meetings each week get repeated again online because of the distractive nature of the technology, as well as due to the fact that in many instances it is the real-world, physical closeness of people that provides the best communication. Online business meetings provide an illusion that progress is being made when in many instances those web-based conferences are delaying things and causing fatigue, stress, overload and a waste of precious time. Just because you can call an online meeting, doesn’t mean you have to do so. Sometimes, your objective can be met with an email, for instance. Even though you may have Skype, or WebEx or GoToMeeting, or Zoom installed on your computer does not mean that it is a requirement to use that service. Step One in improving productivity is to consider what is the most appropriate method of communication to achieve the objective. Sometimes it might be email, or it might be a team communication system such as Slack. Step Two is the preparation of a clear agenda with specific objectives. That’s often the problem with face-to-face meetings where agendas are too general and objectives too broad. The final step is to work out how long it will take to achieve the desired outcome of the meetings. If that is only 15 minutes, then so be it. Rather than the usual “please put an hour in your diary”, be specific about start and end times. Not only does that focus the mind of the participants, it means you will avoid tangents during the meeting itself. 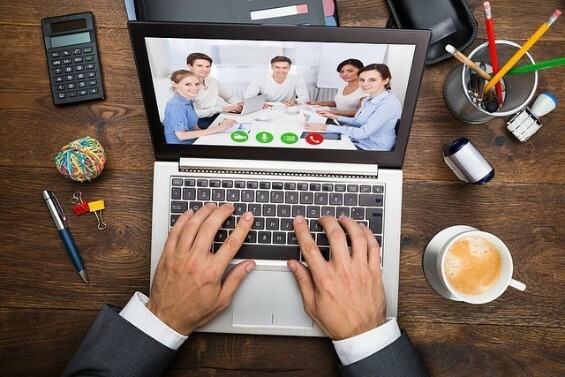 Online meeting technology and video conferencing clearly have advantages, however, many firms are letting the technology control them, rather than the other way round. It’s time to wrestle the productivity demons away from online meeting technology.